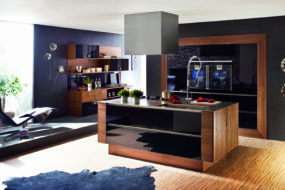 Have a look around at the different styles of kitchens and appliances, ask questions, open the doors and drawers – feel the quality! We will talk you through our design process, then you can retreat to the comfort of your home, discuss and write your wish list. Make an appointment at our showroom with our kitchen designer, where they can sit with you for 30 to 60 minutes and discuss your wish list, select your door and work surface choice, and chat about how you want your kitchen to look, work and appliance needs. Once you have your design, we can now discuss changes, and develop the design to meet your wish list with our design additions, working carefully on the layout. Once you are happy with the layout, a meeting with your designer is needed to discuss unit options with in the design, tailoring and bespoking the design especially for you, a one off! 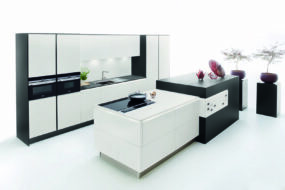 Remember this is not a flat pack kitchen, this is a German manufactured Kitchen, built exactly to our design, this takes time and care in the design process, this way you will get your Dream Kitchen. 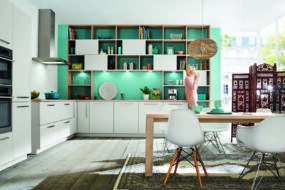 When you are entirely happy it’s time to order your kitchen, on paying your deposit we order the kitchen, agree delivery dates and install dates (these will depend on your own schedules and on the level of work we are doing). Remember we can do the whole refit, including building works, plastering, plumbing etc to just a simple delivery only option. 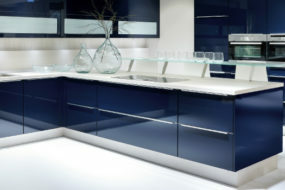 This is carried out by Kitchen Kit’s specialist installation team, to the highest of standards. If you are having stone work surfaces the template and installation of these will follow the furniture installation seamlessly. Time to start cooking in your dream kitchen and hopefully showing it off to your family and friends. Kitchen Kit do not offer a ‘standard’ service. We are able to do as much or as little as a customer wants. This can include electrical work, plumbing, plastering, floor tiling, painting and decorating, and the removal of your existing kitchen and wall tiles. The service is different for each individual customer, as each customer is completely different in their wants and needs. Please feel free to speak to us about any extra work, no matter how big or small.